BeldarBlog: MoveOn.org's new ad campaign: "Nanny nanny boo boo, Petraeus is stinky and Bush is too!" MoveOn.org's new ad campaign: "Nanny nanny boo boo, Petraeus is stinky and Bush is too!" 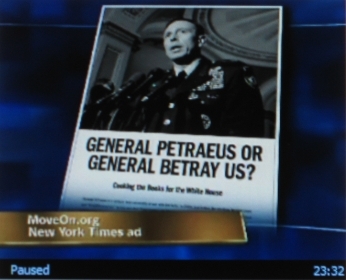 I gather that "the antiwar group MoveOn.org is running a full-page advertisement in the New York Times [today, i.e., Monday,] under the headline: 'General Petraeus or General Betray us? Cooking the books for the White House.'" I know there are mature, thoughtful, and patriotic Americans who will listen to and consider what Gen. Petraeus says this week, and who will nevertheless find it unpersuasive, or judge his testimony to lack credibility, or will accept it in part and yet reject the conclusions that the Bush-43 Administration will urge based upon it. Many, but not all, of the mature, thoughtful, and patriotic Americans who react in these ways will be Democrats. Some of them will be leaders in the Democratic Party at national, state, or local levels. I don't feel obliged to make a blog post every time some hard right nut-case updates his website on how the real explanation for American history over the last two dozen years can only be explained by Hillary Clinton's involvement in Vince Foster's suicide. But MoveOn.org channels dozens of millions of dollars to Democratic Party candidates. It demands attention. It buys full-page ads in the NYT. It's hard to ignore. Will you condemn and disassociate yourself from MoveOn.org's scandalous character assassination? Or will you associate yourself with them, including their "Petraeus --> Betray Us" wordplay, a juvenile antic of which any moderately self-respecting third-grader would be ashamed? UPDATE (Tue Sep 11 @ 2:10am): Here, from blogger Big Tent Democrat at TalkLeft, is an example of a grown-up, intellectually honest disassociation. I heard some Democratic Congresscritters doing the same on TV earlier tonight as well. I wish there were more like that, and fewer like the folks who are making the decisions for MoveOn.org. If I am not mistaken, calling Petraeus "General Betray-us" is questioning the good general's patriotism. For years the anti-war left has declared that questioning someone's patriotism because of their position on the war is out of bounds. Now they are doing it. Can we now question their patriotism? What's fair for one side is fair for both sides. Betrayal was a carefully chosen word with special meaning in the military lexicon. Betrayal is the act of "delivering to an enemy by treachery"
The person who "betrays" is a "traitor"
The overall crime of betrayal in a larger sense is called "treason"
They knew what they were doing, it is unforgivable. I expect it will further poison relations between the military and its veterans with the Democrats. And rightly so without sudden and loud condemnations, which I have not heard yet except from Lieberman (of course) and Biden (who talks too much, but is an adult on foreign policy). A bunch of silly little boys with money. If that's an example of an honest grown-up on the left, they are even worse off than I thought. Beldar, surely that's not the best out there?! He decrys the Republican tactic of labeling someone with whom one disagrees. Rarely done by the GOP with the traitor label (despite liberals who truly have betrayed the country). I'm curious what he thinks of the many Democrats in DC who routinely call Republicans "racist" because of policy disagreements. If MoveOn's claims were so outlandish, we would have seen them debunked. I haven't seen it yet, though. I'd also suggest that focusing on the silly headline / pun to the exclusion of the substance tells the country all they need to know about the right. To see MoveOn.org's claims debunked — in detail, which had the effect of also refuting the broad-brush headline of their ad — you should have watched Gen. Petraeus and Amb. Crocker during their two days of Congressional testimony, jpe. There are all kinds of organizations at various degrees of off-center views and methods. Move-On does what it does, Ann Coulter says what she says, and other people in associated parties aren't responsible for what they do. To disassociate means not to support them, not to bend over backwards to complain about them or to feign a compensatory opposite opinion to compromise with the opposition. IOW, there are indeed racist organizations but that does not invalidate the argument against illegal immigration, etc. As for how to treat extreme voices on your own side, how many conservatives disavow Ann Coulter, Mike Savage, etc, who routinely put out slanderous talk against groups and persons? Beldar: The testimony by Petraeus and Crocker can't debunk Move-Ons claims unless you can be sure their testimony was accurate and not spun. Can you? Look who they report to. Neil B, thanks for your comment. Opposing views are welcome here when civilly expressed, as yours are. I anticipated and pre-addressed the point raised by the first paragraph of your comment in my original post. When an organization claims to have "bought" the Democratic Party, and indeed has contributed tens of millions of dollars to its and its candidates, then I think a duty to actively disassociate oneself arises, lest the reasonable inference be made that one agrees with the organization's views. We now know which Democratic senators and congressmen and candidates have spoken out (damned few), and which haven't (the vast majority). We know, for example, that neither Clinton, Obama, or Edwards will risk offending MoveOn.org by disassociating themselves from its attacks. We know, in other words, how the shoe fits, and who wears it. "Who one reports to" is only one of many factors that go into credibility. Your second paragraph suggests that no member of the military can ever be trusted to report accurately on anything, since by definition, they all ultimately report to a single commander-in-chief. You may choose, as a citizen, to engage in reflexive hostility toward and distrust of the military. You may not credibly do so while simultaneously insisting that you "support our troops." Thus, you, and MoveOn.org, clearly do not support our troops. Such organizations and individuals are, in my opinion, very, very lucky that our military forces will protect and defend and serve the nation and society of which such individuals are a part anyway, whether they deserve it or not.